Want to send fax to someone and don’t have the fax machine in home or office. No need to worry now you can send fax online anywhere in the world with HelloFax. 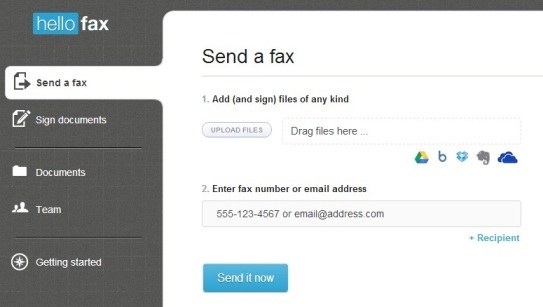 With the helps of this app you can send international fax for free. To do this all you need a hotmail account or Google drive account. With the help of this service you can send fax in any format like Word documents, PDFs, text files, images and several other popular formats. The app allows you to send fax free to any fax machine in the world. Remember one thing with free account you can send fax anywhere in world, but to receive the fax you have to buy an incoming fax number at $7.99 per month. 1. To get started, go to hellofax.com/skydrive and signup with your hotmail account or go to hellofax.com/googledrive and signup with your Google account. After the signup you are ready to send fax online. 2. After the free signup upload any document which you want to send as a fax. 3. Next step is to enter the Fax machine number with country code to send your first online fax from your PC. 4. Now hit the send button to send the fax, once the fax is delivered successfully to the number you will get the copy of the outbound fax document will be automatically saved in your SkyDrive or your Google drive account. From here you can see the fax document. The app is simple and easy to use, it has some other features which you can use to sign the document using your PC mouse as a pen, and also type on the document. As we mention above that the app is free to send the fax, but to receive the fax online you have to pay $7.99 per month.